Look folks, it our governor and we elected him. We are as much to blame for this stupidity and he is. I would be interested in how a pause in global warming for 18 years produces sever cold. I think that Governor Brown must have been protesting during science class. 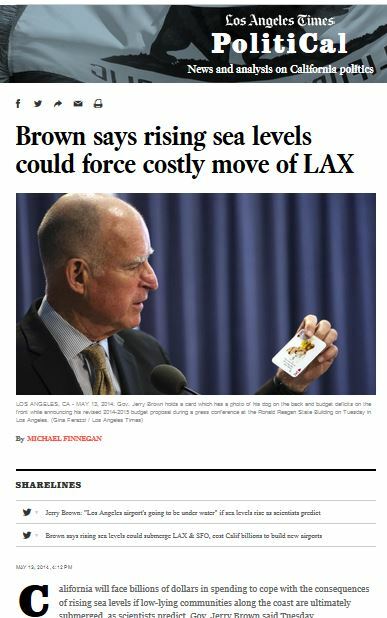 Remember this eye roller from Brown where he claimed LAX was at risk from sea level rise, only to have to walkback the claim the next day after it was pointed out on WUWT that LAX is well above sea level? California Governor Jerry Brown has declared senator Ted Cruz is “unfit for office”, because Cruz doesn’t believe that global warming is the cause of the extreme cold in America’s North East. Previous Article Is the Solar System’s Galactic Motion Imprinted in the Phanerozoic Climate? Russ, You do not know where he got his information from. Remember, there are warming scientists and there are scientist that tell exactly as to what is happening with the climate. Or maybe these so called warming scientist are telling politicians this to make fools out of them. Just like, you can keep your own doctor, and your health insurance cost will be cheaper and more affordable. I wonder who promised us that? Could this be revenge? Or maybe they just really do not know as to what is happing with the climate. I do not know where the Governor gets his information. The warmers have been holding conference at Lake Tahoe, and may have been feeding him carp science there. Not sure who sponsored the conference.